Stay fully charged with this Stanley 40 Amp Automatic Car Battery Charger w/ LCD Display, 1-Touch Technology & Moisture Protection! Get it for only $49.99 at Sears now. Have you ever been left for hours with dead battery? That can be a memory you never have to relive again. 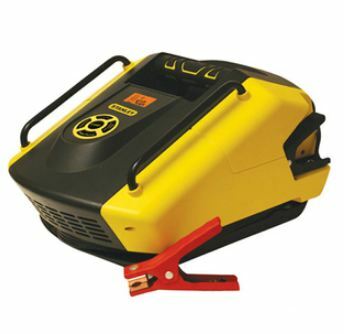 Charging your car battery is a breeze with this Stanley Battery Charger. This innovative device automatically selects a charge rate from 0 to 40 AMPS to maximize battery life, charge speed and maintenance. The easy to read digital-display LCD screen offers clear and concise information. Other features include spark resistant reverse hook-up protection, microprocessor controlled digital diagnostics and a moisture protection coating.